When Michele first asked me to be a Guest Blogger on Quilting Gallery, I was extremely flattered .. then nervous as a cat in a room full of rocking chairs .. EGADS!!! ME?!?!?!?!? I’m not anyone famous, just a person that loves to quilt, blog, learn new things, and knit. Okay, I thought about it and needless to say, I agreed as here I am. I wasn’t too sure what to say, but my quilting journey and it’s beginnings was suggested by Michele .. Okay – I can do that …. My journey started in 1995 after my son was born. I was in Joann’s looking for some fabric or yarn to make something for my son. He was long as a baby and while it’s cute for a belly to peek out from under a shirt, it’s not something you always want to see .. so I made his clothes, and knitted his sweaters, jackets etc. 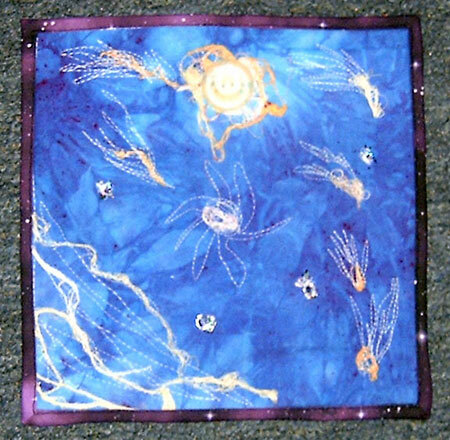 While going through Joann’s I happened to see a BOM packet that had blues for fabrics and a star!! Oh did I like that star .. I looked at the price, and while I can’t remember exactly what it was, I’m thinking $4.99 or something like that .. I thought why not … for $5, if I don’t like it, I can scrap it and that’ll be that. It seemed like a good price for something new to learn and maybe like. Oh geeze o pete .. how I remember that well!! I can’t remember what block it was – but I do remember my ‘journey’ with it! I read the instructions on a &#0188″ seam and pressing to one side. So after reading that i was confident that I could do this. Now this block “might” have inset seams as well. I truly can’t remember. Templates and inset seams for someone that had never quilted a day in her life .. what was I thinking???? Now these BOM had pre-cut pieces for them, and they also included templates for them as well. I did my &#0188″ seam, pressed it to the side, and so far so good .. all my pieces looked great .. then came the putting it together .. Oh My Lord what a MESS!!!! That thing was so funky and wonky, I was amazed that it didn’t jump off the table and run away in embarrassment!! I know I followed the directions, and I KNOW I did a straight, &#0188″ seam – I was at a loss and incredibly frustrated – I must have ripped out that thing 10 times if not more. I was at a friend’s house and she suggested that I place the fabric pieces on the templates to see if they were the right size .. it never occurred to me that they wouldn’t be .. well that was the problem .. they weren’t cut right .. so I grabbed from her stash and recut the pieces. AHA .. that did it!! It worked just fine then .. I ended up getting all the blocks for that year and put them together as a quilt for my dad for Christmas! Of course this quilt ended up being scrappy as I didn’t trust the pre-cut pieces after that! So that started me off on my quilting journey. If I wasn’t so bloody stubborn and determined, then I’d likely not have gone past that first block! But, past that first block I went – and with a vengeance too! 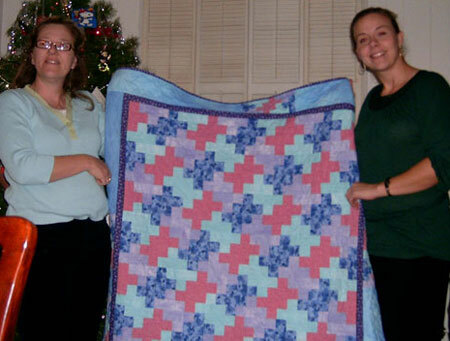 I took my first class that year and made 10 quilts for Christmas presents that year as well as a fish quilt for my friend that was going to Germany for her undergraduate work. I was well and truly addicted! I joined several online lists and found a mentor that was 30 miles from me who I would sew with every other weekend. She taught me so much! 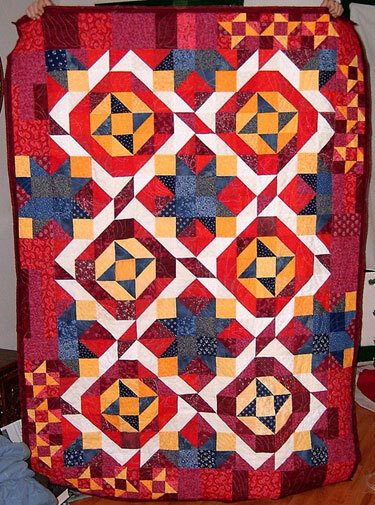 When I got back into quilting last year, and I was remembering all the stuff she taught me, I called her to thank her .. she had no clue what I was talking about and was rather surprised to hear from me – when I outlined for her all that she had taught me, she was flabbergasted, but accepted my thanks with grace. From there I went on to acquire a stash, join block and fabric swaps and try several different styles of quilting. 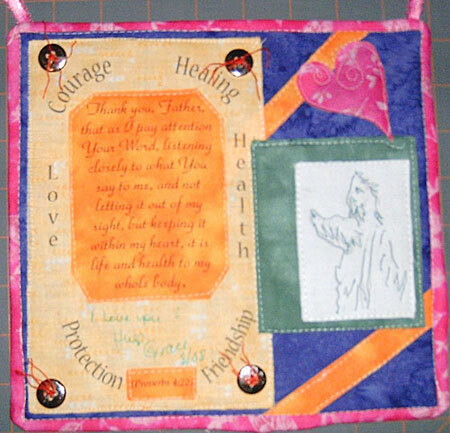 I learned paper piecing, inset seams, applique, watercolour quilting, traditional piecing, rotary cutting. 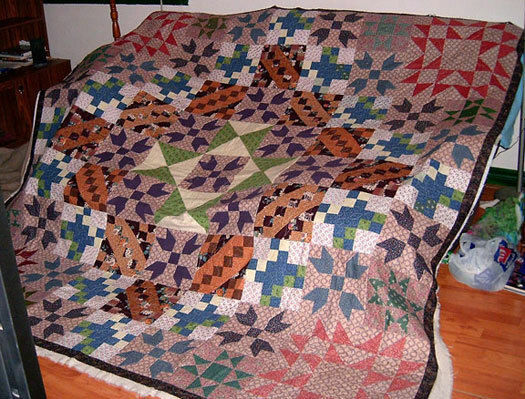 I also did all facets of quilt making – from cutting to sewing the binding down. I have done hand quilting, machine quilting doing straight line and free motion. Recently I’ve tried my hand at designing and am loving some of the patterns I’ve come up with. Fabric dyeing!! Oh wow do I have fun with that and, of course, I did my first mystery this past year and even wrote one! I’ve also taken the dive into fibre art – I’ve only done 3 pieces, but do plan to get more of them done – I do enjoy doing that as it’s a quick project that helps for a break on the larger projects. Oh and all these techniques, I’ve learned on my own – I’ve only taken one formal quilt class :). I’ve also enjoyed all steps in the process of making a quilt, but lately basting is my nemesis. I’ve been using the Sharon Schamber’s method – and it is awesome, but I think that my boards are too flimsy, so I’m getting puckers on the back .. so currently I hate basting, but will keep at it until it goes right again ..I used to baste just fine, so it can be fixed! 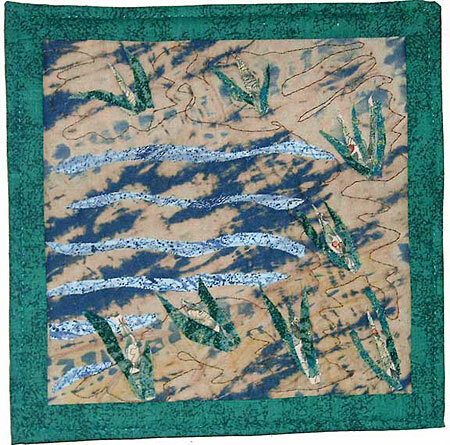 My current love for quilting is design, fibre art and hand-dying fabric! 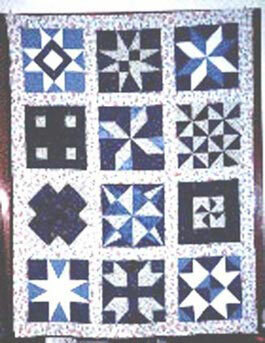 I’m loving designing quilts – I designed the quilt I made for my son for Christmas this year called Kyle’s Spinners. Dyed the fabrics for my cousins’ quilts that I made them for Christmas this year. Erica’s had 3 hand dyed in it, plus the backing and Matthew’s had the background yellow hand dyed. While Matthew’s quilt wasn’t my design, Erica’s was rewritten by me and placed as a tutorial on my blog. I’ve also received many compliments and requests for the the pattern/layout I did for my 1800s quilt , (still unfinished, but 90% there). This quilt is king sized, so I researched quilt as you go and have been doing that technique for this quilt – all this needs now is to have the back seams hand sewn and binding. I’ve started an online business, Qzone Quilting to sell my quilted items. There isn’t much there in the way of quilts yet, but I do have totes, hot pads, 2 baby quilts, table toppers, etc. It took me a while to chose my direction for my quilted products, but I’m leaning towards lap quilts, wallhangings, quiltlets (fibreart) and baby quilts. I have way too many WIPs right now to even consider doing a bed-sized quilt for sale. That could be a future project if/when I see that there could be a demand for it. But my site is a good way to play with my passion and hopefully it can supply my stash with new goodies! Unfortunately, I’ve not updated those pages in quite a while, if you have any questions, please feel free to ask. One of the online lists I belong to, is an extremely active online group – it is the closest I’ve actually seen to an old-fashioned quilt bee! The owner, myself, the other mods and some members, are busy designing patterns and activities for our membership to do as well as teaching new techniques. This was where my first mystery was published and I’m currently working on another mystery for this group as well. This year it’s my plan to get my poor WIPs finished and start some new designs – maybe even try to get one published :) and learn some new techniques as well .. maybe I’ll be a hand applique queen by the end of the year (yeah right!!) or even a hand piecing queen! No grandiose plans other than to learn more and finish more. Michele, thank you for letting me guest blog for you!! OMG! I did that Joann’s BOM, too! What a blast from the past! Love your post grace. You are a very talented lady. Glad to call you my friend. Grace, you did a great job, and I learned a lot about you! You really are multi-talented. I also did the Joann’s thing, and it’s true – the pieces are definitely not cut with precision! I am so glad that I stopped here and learned more about you. You certainly have had an adventure and I love your quilts. 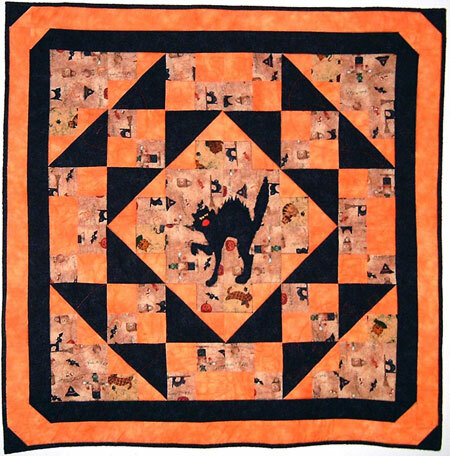 Well,well,grace…I finally got time to read your blog…I love it and you are so talented…I have never done one of those quilts from Joanns but see the blocks there all the time. 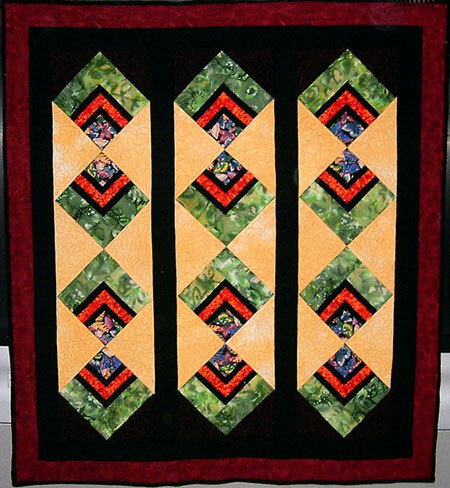 I am a memor of the Wiregrass Quilters Guild from Fitzgerald Ga.I have been quilting for about 20 years and have been a seamstress since I got married and had kids..LOL..made my kids clothes even before I got a sewing machine.